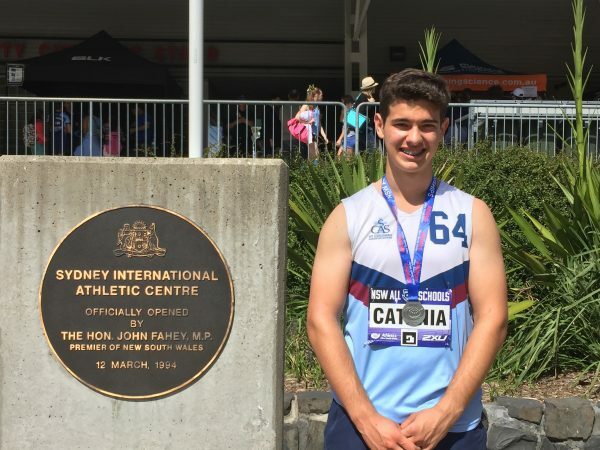 Two SCAS students, Matthew Catania and Jack Mills, recently attended the NSW All-Schools Athletics Championships held at Sydney Olympic Park Homebush. Athletes are invited to attend this event if they have met qualifying benchmarks as set by Athletics NSW. Matthew competed in the 16 Years Boys Hammer Throw, an event which he has achieved great success in over the past 3 years. Matthew was unsure of how he would perform going into the event this year, with a limited preparation due to increasing rowing commitments. After the first round Matthew was leading with a distance of 47.03m, a distance which would ultimately place Matthew in 2nd place and replicate the silver medal finish he achieved at the corresponding event last year. Jack competed in the gruelling 3000m track event, an event which he placed 2nd in at the CIS Athletics Championships last term. The race started at a fast pace, with Jack maintaining contact with the leaders for the best part of the race before fatigue set in. Jack was still able to achieve a Top 10 finish, and while disappointed with his time (some 20 seconds slower than his result at CIS), he will be better for the experience. Congratulations to both Matthew and Jack on these wonderful results.